I think scientists need to approach their research from the standpoint of Ocham’s razor. This way of thinking is by far the best way to analyze complex experimental data where many parameters are interconnected and cause / effect relationships are convoluted. From time to time, I will be posting cases in which Ocham’s razor might not have been applied. But first – what is it? This tool of logic posits that out of several plausible hypotheses, the one with the fewest assumptions is the winner. In other words, the simplest explanation is usually the correct one. We were discussing an interesting Nature Chemistry paper at our journal club today. 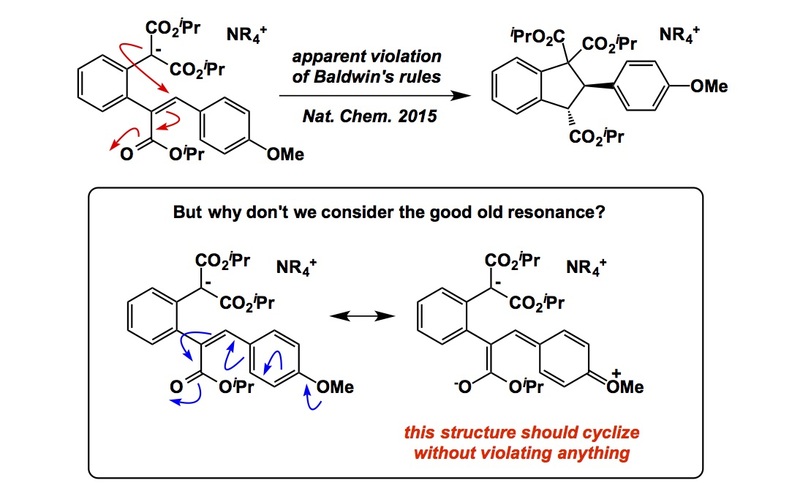 The asymmetric phase transfer-catalyzed reaction described by Paton and Smith is billed as a violation of Baldwin’s rules. On a cursory look, it does appear to be an example of the disfavored 5–endo–trig process (see top equation in the graphic below). A theoretical rationale put forth by the authors includes a sophisticated quantum mechanical backing. I like the reaction, but if I were to apply Ocham’s razor here, I would consider a simpler resonance-based explanation shown at the bottom. 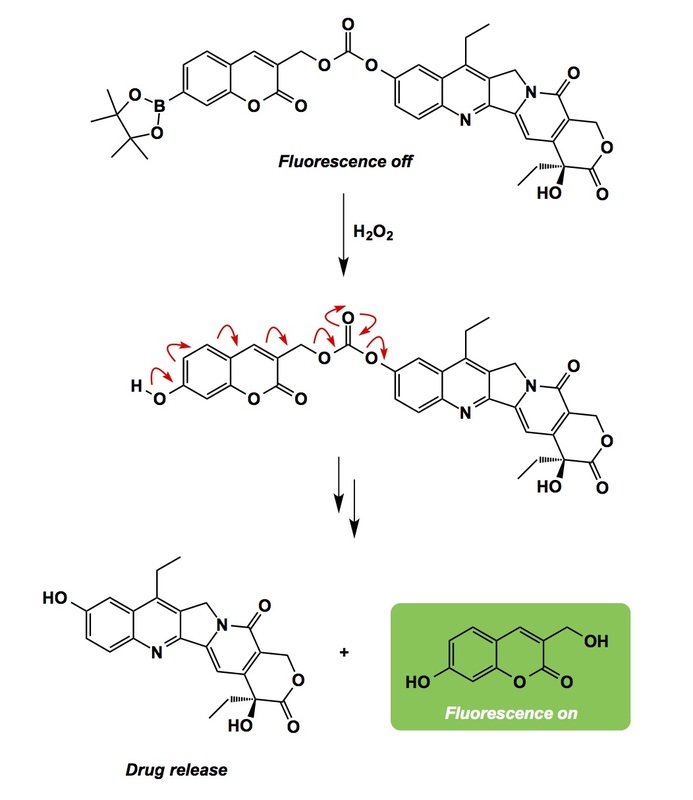 Here I am using the methoxy substrate (incidentally, one of the better ones in the paper), although we all know that the Curtin-Hammet principle might “rescue” the less fortunate reactants. My goal here is not to say that the more elaborate explanation offered by the authors does not have merit. It is possible that my suggestion is energetically unattractive, but I think it ought to be considered and thoroughly evaluated in addition to the more complex ideas that are being presented. By the way, I have always liked how Eric Carreira refers to Baldwin’s rules as Baldwin’s “suggestions”. One can often avoid violating these “commandments” using resonance structures. Professor Dean Tantillo of the UC Davis visited us last Friday and gave a thought-provoking talk that made me consider, once again, the way reactants traverse barriers on their way to products. No process is more fundamental to our understanding of chemical reactivity than the one that describes how energy barriers are being overcome by activated molecules. In a departure from textbooks, several of Dean’s recent works describe bifurcations of reaction paths, wherein the selectivity-determining step occurs after the transition state. I mentioned this on my blog in the past. Now that I heard the details in Dean’s talk, I really marvel at what computational tools offer these days. I think we have all witnessed the evolution of quantum chemistry approaches from mere explanation of experimental facts to prediction and uncovering some of the “unknown unknowns.” Bifurcation of reaction pathways is just that. As I was listening to Dean’s lecture I noted a certain analogy between bifurcation – that “fork” in the downhill slope – to tunnelling. The analogy does not have anything to do with any causes of these clearly different phenomena, but there is something to be said about how Nature “cheats us” in both cases. Tunnelling describes how particles slip through energy barriers rather than surmount them. There are no (to my knowledge) enabling applications of tunneling in chemistry (I mean none of the “Hey, why don’t I use tunnelling to design my new catalyst…” sort of stuff), but tunnelling certainly helps understand some processes, especially when it comes to light atom transfer. Below is an example of tunneling in organic chemistry. 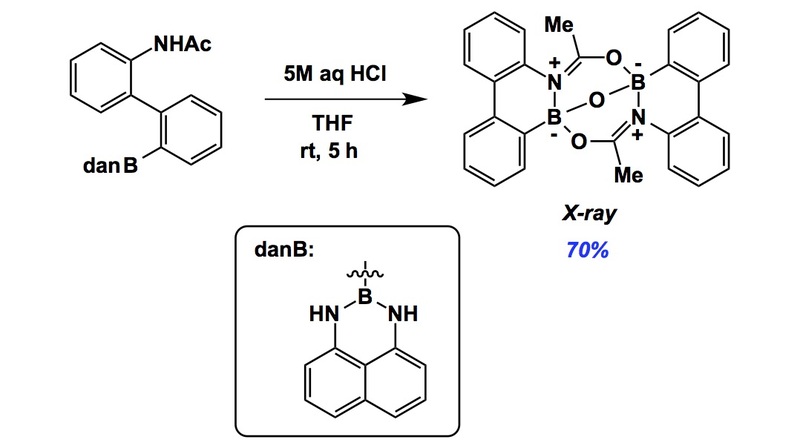 Without going into the details, let’s just say that it is possible to spectroscopically differentiate the syn and anti forms of the hydroxyl-substituted pyridine derivative shown below. The authors have found that the rate constant for the syn-to-anti conversion in the deuterated case is several orders of magnitude smaller than that of the protio derivative. Thus, this process is very likely a tunneling reaction. I have been meeting with some undergraduate students who are keen to do research over the Summer. While answering their questions, I kept coming back to how I myself was drawn to research many years ago. As I found rocket science boring, I eventually stumbled upon chemistry, which really captivated my attention. But you might ask me: what was it that got you interested in organic chemistry back in 1988 (this is when I just started my second year of undergrad in Moscow). I was trying to recall the first paper I had read that really made me think more about organic chemistry. In fact, I now remember that paper quite well. It was the 1975 account by Randic in JACS (given to me by my advisor, V. Palyulin). In it, Randic introduced a mathematical index that later became associated with his name. The most fascinating thing about this parameter is that it looks at molecules as if they were “graphs”. Below is how this index is calculated. 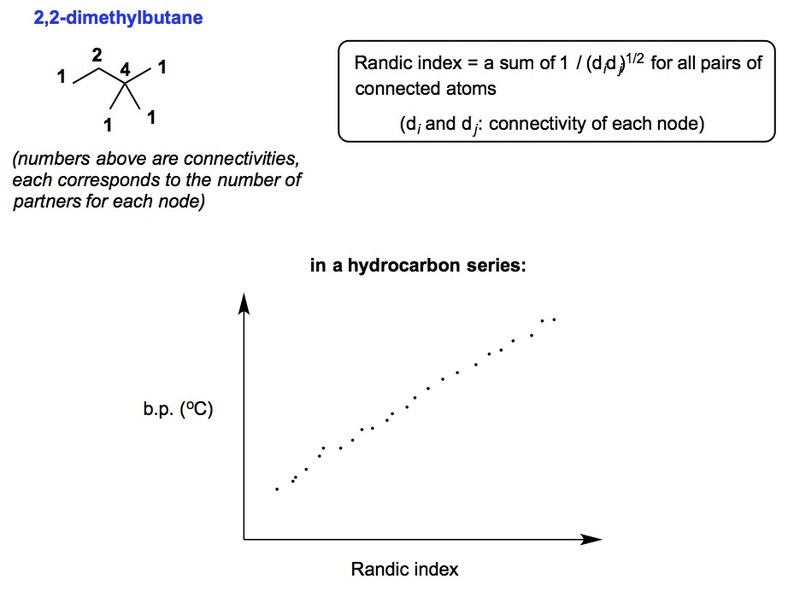 There are several molecular properties that show a linear correlation with the Randic index. I think there is something magical in correlating a measurable physical property with something that has nothing to do with any advanced quantum mechanics, but is merely a reduction of a chemical structure to a number. This seems really bizarre. Underneath the formula you see how a correlation with boiling points in a hydrocarbon series would look like (but please look at the JACS paper for the “real” thing, I just reproduced what I saw there using ChemDraw). For me, this is pretty interesting (and I still do not fully understand this stuff).